Step 7 asks us to humbly petition the Lord to remove our shortcomings. When I first worked through the steps, I had the naive and wildly optimistic hope that, having become willing to allow God to remove all of my character weaknesses in Step 6, when I asked him to remove them in Step 7, they would all magically disappear with a wave of his omnipotent hand. I was sadly disappointed. I came to understand as I continued to work the steps, that it was a joint effort; there would be footwork for me to do. It was no longer my job to stubbornly try to remove my shortcomings myself through sheer willpower. That much I understood. My new job was to seek humbly and prayerfully for the guidance of the Lord regarding the footwork that I needed to do, and do it. 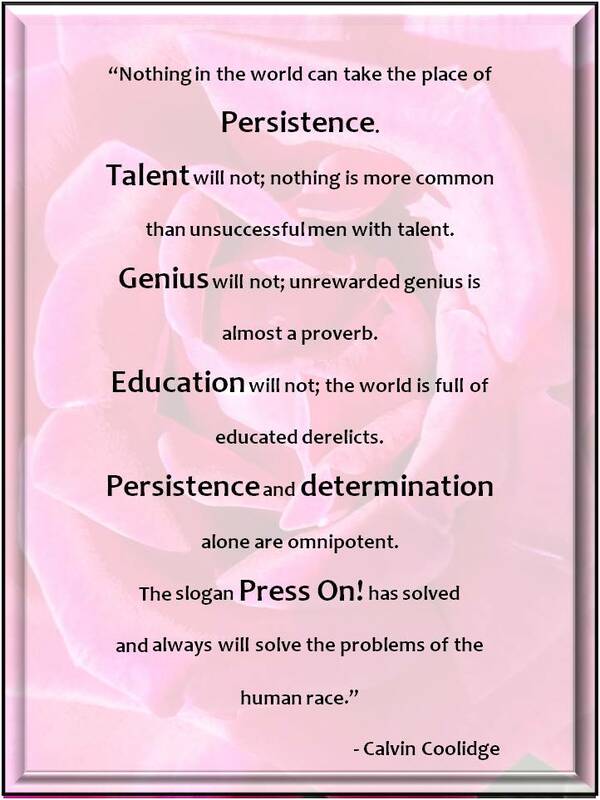 This quote from U.S. President Calvin Coolidge about persistence filled me with hope then, and still does today. I would add one thing to President Coolidge’s thought: we must be pressing on in response to divine guidance. The adversary does not want us to be persistent, especially not in applying the Atonement in our lives. He wants us to give up. When he can frustrate us enough to make us quit, he is delighted. But he will also accept good intentions delayed indefinitely. I once heard someone say that the Devil doesn’t need to talk a man out of doing something good; all he needs to do is convince him to put it off until tomorrow. Prayerfully seek guidance on what footwork you need to do to enable the Lord to remove your weaknesses and shortcomings. Ask your sponsor for feedback from personal experience and observation of you. Write about it. Then do the footwork with persistence. Don’t let the adversary discourage you. You will not do it perfectly. It’s okay. Just Don’t Quit! What weaknesses and shortcomings are you trying to release? What footwork has the Lord given you to do? Are you doing the footwork with persistence or do you stop and start? What are you willing to do to improve in your efforts?